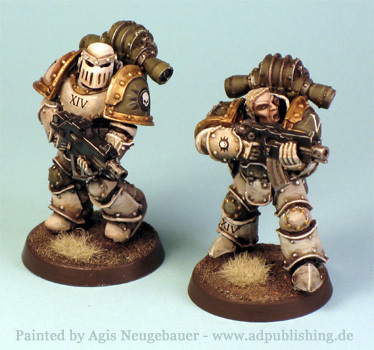 “The Death Guard, formerly known as the Dusk Raiders, were Legion XIV of the original twenty Space Marine Legions. 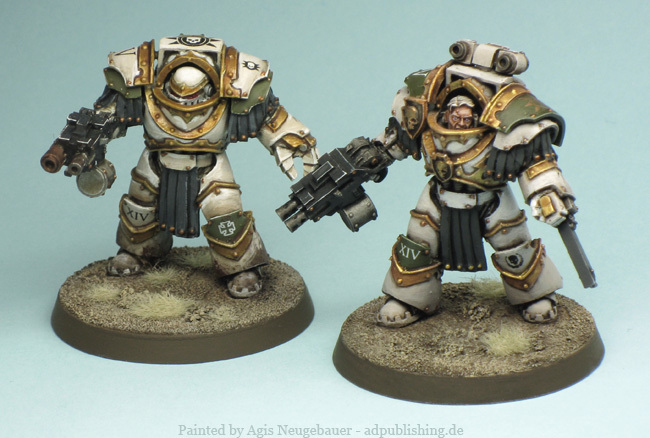 Their Primarch is Mortarion, who relocated their base to his homeworld of Barbarus after his discovery by the Emperor. During the Horus Heresy, Mortarion and the majority of the Legion swore allegiance to Horus, becoming one of the nine Traitor Legions who betrayed the Emperor. 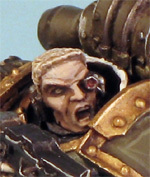 After Barbarus was destroyed during the Heresy, they relocated to the Plague Planet inside the Eye of Terror. 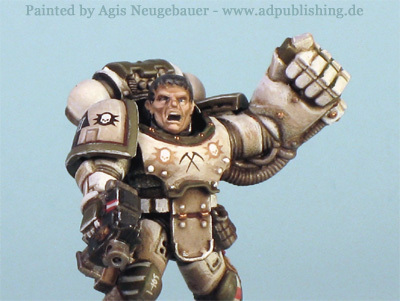 Before reading the excellent Horus Heresy Novel “ Flight of the the Eisenstein” I always disliked the Death Guard. 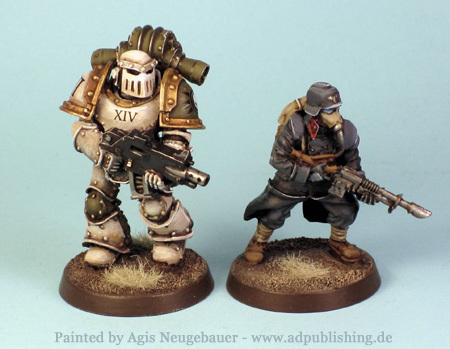 To be honest the whole Chaos gods - and the Lord of Decay in particular - idea of 40K is not appealing at all to me. The Horus Heresy books changed that a lot. I really liked the way Garro acted and even more in the following short stories centred on him. 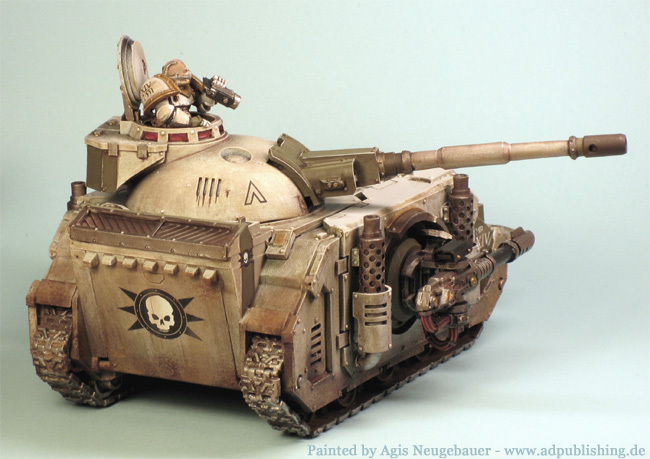 So when Forge World previewed the Death Shroud Terminators I was hooked. So time for a start - 1st test mini painted. I will use the minis also when playtesting my Victory Decision SciFi rules, so expect a lot more in the next months. 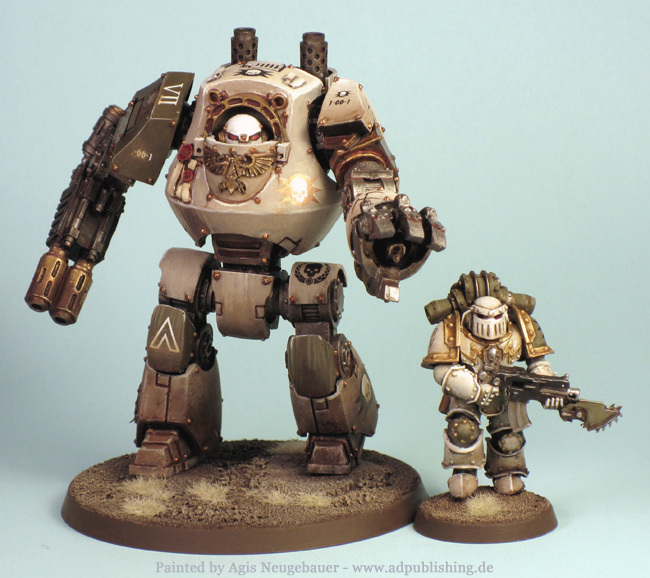 I was also positively surprised how well the HH Marines Mk III scales up next to a Forge World Imperial Guard. The Marine DOES look big enough! 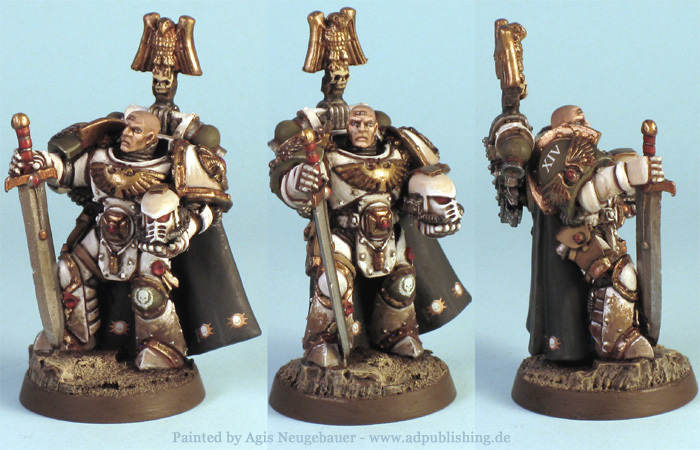 Nathaniel Garro wearing a mixture of Mk II and IV armour and his sword libertas. 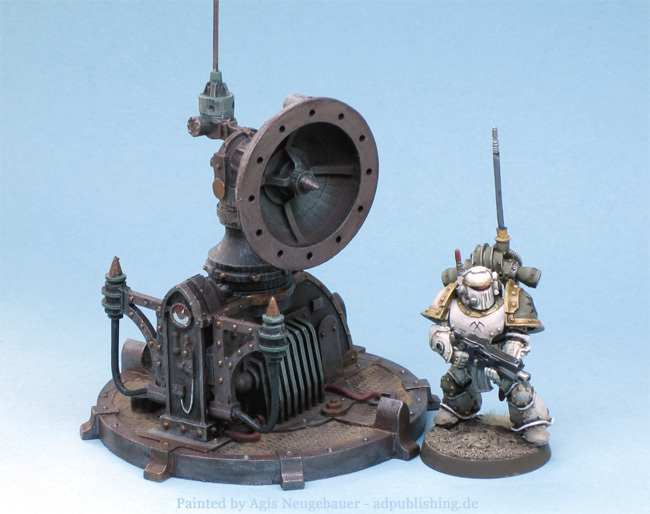 Some info on the mini: it is of course based on the SM mini from the Master of the Chapter box. Since the PF would be not fitting and Garro often wears Mk IV armour I used a suitable hand and helmet. I then added an Aquila to a MkIV backpack and repositioned the head. The idea is to have him wear a prototype armour. The first half squad; one Marine carries the Nuncio-vox, one the Legion Vexilla. 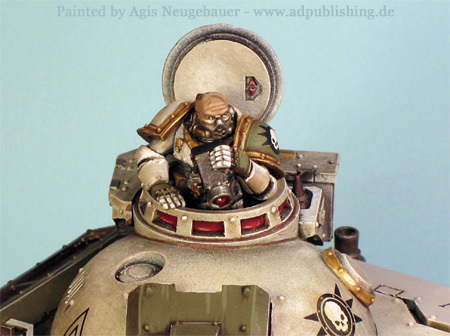 The mini below is my attempt to convert a Marine with the look of the Marine from the “Flight of the Eisenstein” novel cover. Components used: FW Mk II body, Blood Angel plastic head, SM Captian plastic PF and BP arm and legs, standard backpack. After that a lot of FW decals. 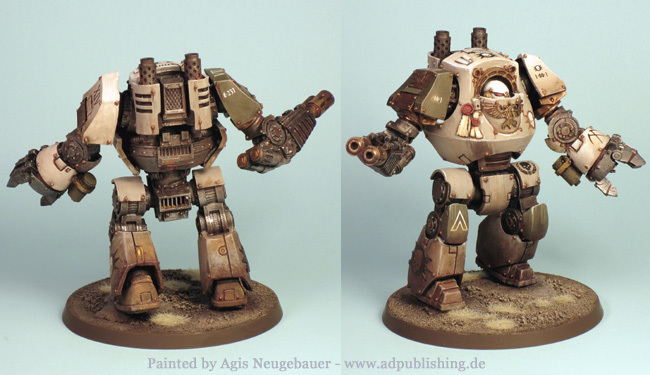 A Contemptor Dreadnought with Meltagun and Powerfist. The Melta and Fist are fully magnetised and the shoulder part is pinned and movable to make weapon swaps possible. 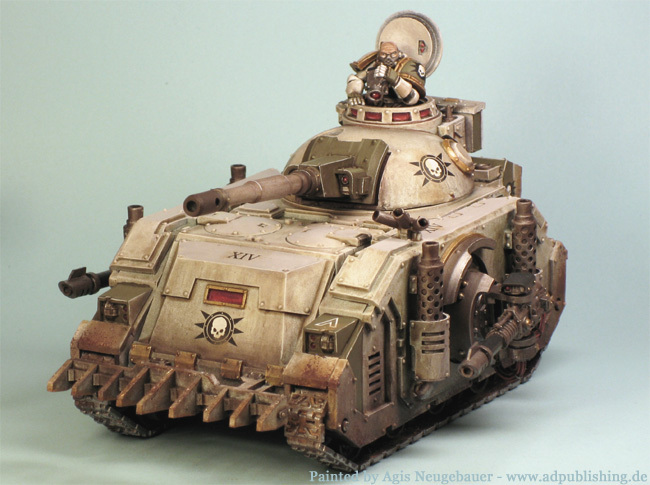 Next painted model, a Deimos pattern Predator tank, armed with Autocannon and sponson mounted Lascannons. 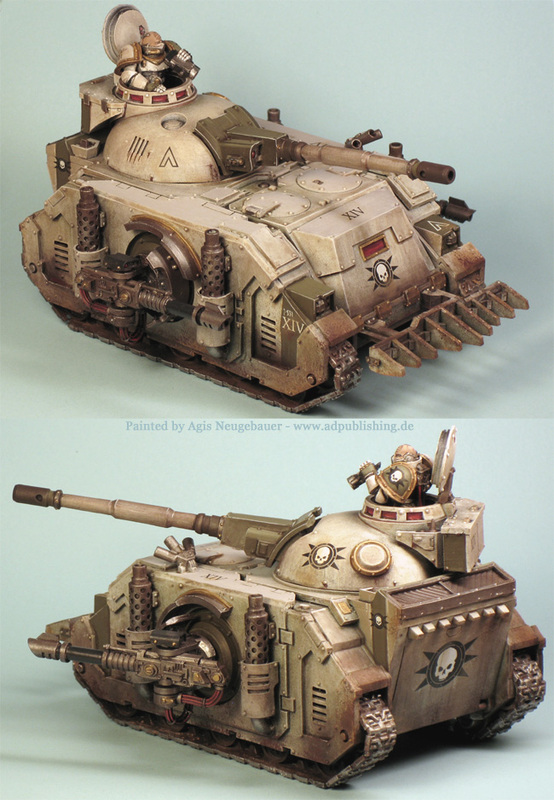 The Lascannons are fully magnetised to make swaps with Heavy Bolters possible. Finally my first Death Guard Terminator. 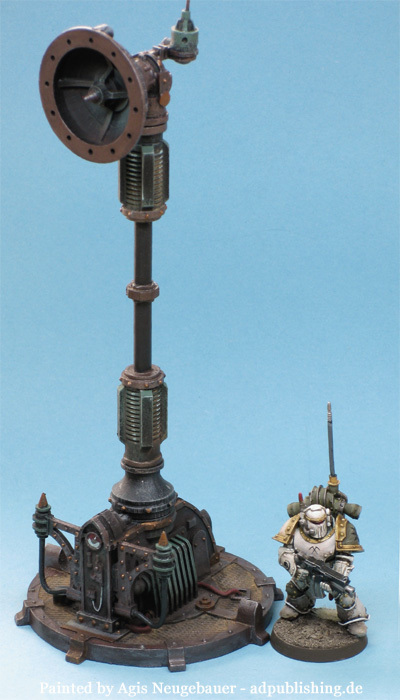 Some scenery for the Death Guard, the Quantum Gothic Communication Array! The model really shines when the antenna extension is used! 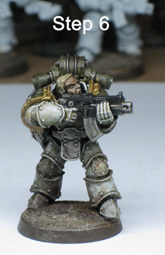 How to paint the Death Guard? After showing the pics above I received a lot of requests about a small tutorial. Normally I really do not like to write about how I paint my minis, since there is NOTHING special. Just all the techniques that are explained over and over on the net anyway. But - here we go: Step 0 - pick a minis you like. The mini to get painted is the Sergeant of my 1st Tactical squad. 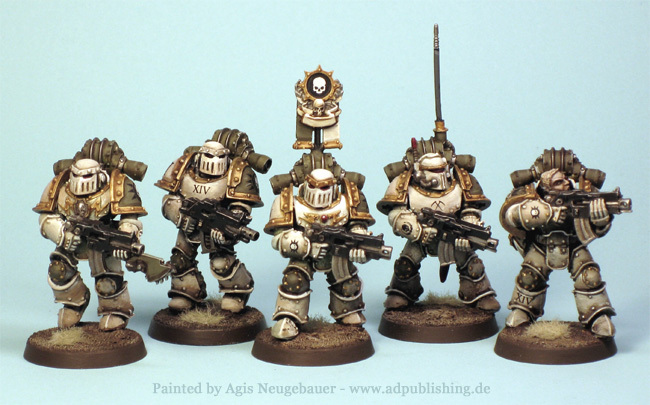 7th company of Nathaniel Garro. 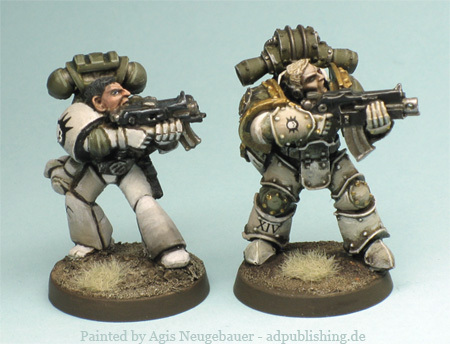 I still have 1 or 2 minis from the old times of Rogue Trader. While looking almost comical bad when applying today’s tastes and standards, there are some nice poses. So I tried to emulate the pose of the mini shown. I added a Grenade and a pouch to the back, used a head from a Deathwatch Marine and glued the Mk III helmet to the side. The mini is stuck on some milliput, sand is also already applied. Step 1 - Prime the mini. Step 2 - apply base colours: Vallejo Brown Violet 70887 for the green parts, Vallejo Black Grey 70862 for the bolter, GW Boltgun Metal and Burnished Gold. Step 3 - Inking - OK, for me not really inking, I brush a mixture of Marabu Matt and Army Painter Dark Dipping on the mini, not as glossy as Army painter. If you are really lazy or only want a decent tabletop quality - YOU ARE DONE now! Just add the decals and varnish everything. Step 4, 5 and 6 - Pigments. I am brushing the pigments on the mini and apply a good amount of Pigment Fixer afterwards. 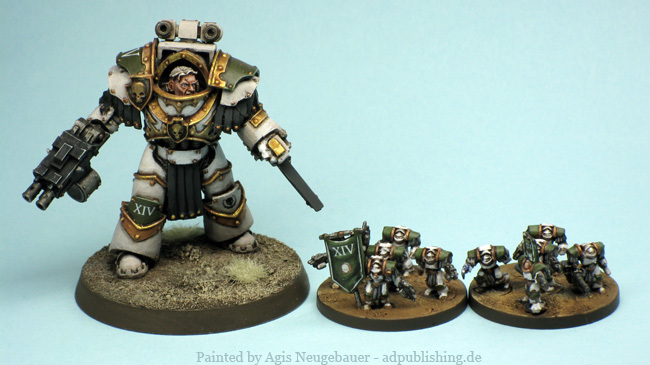 Don’t overdo it - it is only a small infantry mini! Any excess pigment can be removed while the Fixer is still wet. Step 6 shows the dry mini. Last Steps - Detail work and highlights. Add any transfers you like. I use Vallejo Decal Medium and Decal Fix to give the decal a good matt finish. As you can see most of the steps above really do not need any particular skill, just a steady hand and some patience. The next steps are a bit more demanding. I paint all the highlights on the minis, mixing more and more white into the base colours above. At the end the minis gets a matt varnish, since I have no access to the legendary Testors, I am using Tamiya Matt Varnish these days. Done!